One of the six remaining undefeated NFL teams will be on the field in Cincinnati on Sunday when Seattle visits. 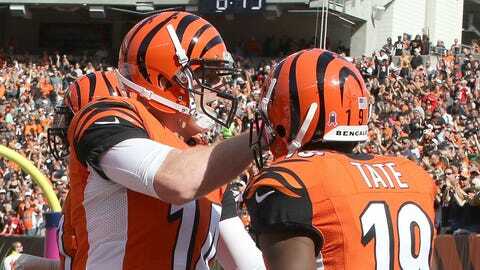 Not only are the Bengals 4-0, they’ve been as impressive as any squad one-quarter into their schedule. They rank second in total offense, are plus-3 in turnover margin and only Atlanta and Arizona have scored more than Cincinnati’s 121 points. With Baltimore off to a weak start and Pittsburgh missing Ben Roethlisberger, the AFC North could be their domain. Just don’t bring that up to coach Marvin Lewis. ”The players have done what they’ve been asked to do and that’s all we can be,” he said. ”They’ve been down these roads before, and four (wins) doesn’t get you anything and they realize that. For years, they were expected to be the Bungles. That changed when Lewis came aboard in 2003. They’ve made the playoffs four straight seasons, albeit exiting each time after one game. Seattle’s track record is a whole lot better as the Seahawks (2-2) seek a third straight Super Bowl trip. They come off a tight win against Detroit aided by a botched officiating call at the end, and they have severe pass protection issues. ”There’s a lot of ways for us here to get better obviously,” said Seahawks coach Pete Carroll, whose team has rallied from an 0-2 start. The weekend began Thursday night with Indianapolis’ 27-20 victory in Houston. Filling in for the injured Andrew Luck, 40-year-old Matt Hasselbeck threw two touchdown passes to former Texans star Andre Johnson. The Colts (3-2) extended their AFC South winning streak to an NFL-record 16 games. Houston is 1-4. Off are Carolina (4-0), the New York Jets (3-1), Minnesota (2-2) and Miami (1-3). The Rams suddenly have some offensive weapons to go with their strong defense and pass rush. Wide receiver Tavon Austin became the first player in NFL history to have punt returns of 75 yards or longer in three straight seasons and is contributing in the passing game. Top draft pick Todd Gurley ran for all but 40 of his 146 yards last week in the fourth quarter. St. Louis will need all of that pass rush against the league’s top passer, Aaron Rodgers. His string without being picked at home has reached 486 passes and 32 touchdowns. Since James Jones returned to Green Bay after the Giants cut him, he has been dynamic and has six receptions of 25-plus yards. The Falcons have scored 137 points, second in the league to Arizona, and, in a scheduling quirk, already are 3-0 against the NFC East. They’ve reached 4-0 for the first time since 2012, when the team finished 13-3 and advanced to the NFC championship game. Washington is the league’s best overall on the ground, ranking first running it and second defending it. Albert Morris and Matt Jones are a solid combination in the backfield. The Broncos have won the past seven meetings, including all six with Peyton Manning at quarterback. Manning has led seven teams to a 4-0 start, easily the most in NFL history for a QB. But it’s been the Denver defense, ranked atop the league, that has been most responsible for the perfect mark. With 18 sacks, the Broncos are on pace to tie the record of 72 held by the 1984 Bears, but the Raiders have allowed only five sacks. Raiders K Sebastian Janikowski will set a franchise record with his 241st career game. Tom Brady can join Manning and Fran Tarkenton as the only QBs with four 4-0 starts to a season, and against the battered Cowboys, it’s difficult to see him failing. The Patriots are averaging 37.8 points per game during a six-game winning streak that includes the playoffs last season, and All-Pro tight end Rob Gronkowski has been unstoppable. Dallas has stopped cold after winning its opening two matches as key players keep getting injured. The Cowboys do get DE Greg Hardy after his four-game suspension has concluded. They’ll need a lot more vs. New England. The Steelers are 22-9 all-time against the Chargers, but with Mike Vick behind center instead of Ben Roethlisberger, it’s a different offense. Consider this, however: In his last start against the Chargers, Sept. 15, 2013 with Philadelphia, Vick passed for a career-high 428 yards with two TDs, including one rushing, and a 123.4 rating. San Diego gets back star TE Antonio Gates from his four-game suspension and he needs one touchdown catch for 100 in his career. The Titans have won five straight vs. the Bills, spanning 15 years. For Buffalo to change that, it must curb the penalties, and coach Rex Ryan recognizes that. Tennessee’s defense doesn’t have the cache of Buffalo, but it’s quite effective. Linebacker Derrick Morgan has six sacks and two forced fumbles in his past six games. Jim Caldwell did the right thing by ordering his players to put the blown end zone call at Seattle behind them and concentrate on winning a game for once. This could be a good opportunity considering the Cardinals come off a very physical loss to St. Louis, and the Lions’ pass rush is primed. Still, Bruce Arians has a way of getting strong performances out of his players in difficult settings. This is the first of six road games over the next eight contests for the Cardinals. There was some thought that the league would want to flex this one off Sunday prime time. Then the Giants, who aren’t far from being 4-0, learned to finish. Now they look like the favorite in the banged-up and mediocre NFC East. San Francisco looks like a team in freefall. The Niners are trying hard, but all the offseason defections have marginalized the defense, while the passing game is abysmal. Even with a tender arm, Drew Brees produced the winning touchdown against Dallas, the 400th TD pass of his sterling career. Presumably he will be healthier as he faces a Philly defense that tends to run out of gas because it is on the field so often. The Eagles are averaging only 22:48 in time of possession, a recipe for defeat. New Orleans has won five of the past six meetings. Interestingly, since the 12-team playoff format began in 1990, an average of one team a year has made the playoffs after starting 1-3. It would be nice if the Chiefs could find the end zone, but at least their kicker is reliable. In a week when many booters were botching critical field goals and even missing extra points, KC’s Cairo Santos nailed all seven field-goal attempts, a club record. Chicago also won by a foot, on Robbie Gould’s 49-yard field goal with 2 seconds remaining against Oakland. This game pits two of the NFL’s most versatile running backs, Chicago’s Matt Forte and KC’s Jamaal Charles. For bragging rights in Florida? What a sad state of affairs for the Sunshine State that the three NFL teams might not be as good as the Seminoles or Gators. At least the Jaguars were a threat last week, taking Indianapolis to overtime in a game Jacksonville probably should have won. The Buccaneers are winless at home (0-10) under Lovie Smith. The Ravens have won 13 of the past 14 games between these teams, and the Browns’ last win in Baltimore was in 2007. Both clubs have been involved in some tight outcomes so far: The Browns have lost past two games by a total of 10 points and the Ravens’ three defeats have been by a combined 14 points. Cleveland has the league’s worst-ranked defense. It gets one break with Baltimore’s top wideout, Steve Smith, sidelined by a back injury.